We are very sad that we will soon be saying goodbye to our current Executive Director, Gary Sakol, as he moves onto pastures new. We have now started recruiting for a replacement Executive Director. 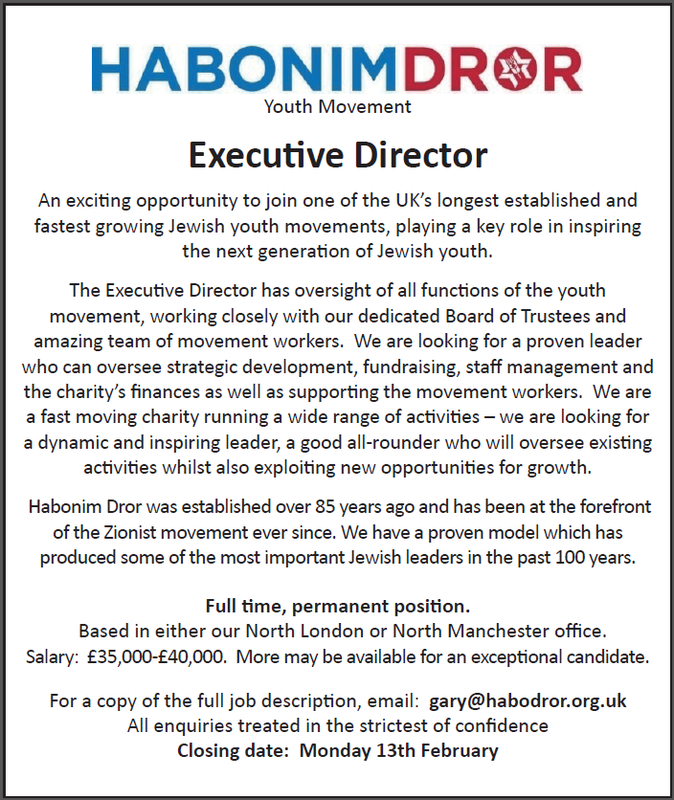 If you are interested in playing a key role in inspiring the next generation of Jewish youth, or know someone who is, be in touch. 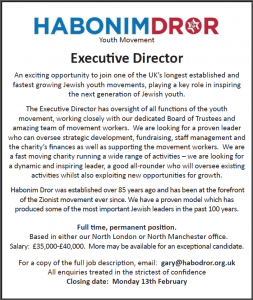 An exciting opportunity to join one of the UK’s longest established and fastest growing Jewish youth movements, playing a key role in inspiring the next generation of Jewish youth. The Executive Director has oversight of all functions of the youth movement, working closely with our dedicated Board of Trustees and amazing team of movement workers. We are looking for a proven leader who can oversee strategic development, fundraising, staff management and the charity’s finances as well as supporting the movement workers. We are a fast moving charity running a wide range of activities – we are looking for a dynamic and inspiring leader, a good all-rounder who will oversee existing activities whilst also exploiting new opportunities for growth. Habonim Dror was established over 85 years ago and has been at the forefront of the Zionist movement ever since. We have a proven model which has produced some of the most important Jewish leaders in the past 100 years. Based in either our North London or North Manchester office.